Motherwell suffered a serious blow in their battle to avoid relegation in a disappointing 1-0 home defeat to Ross County in Saturday's Scottish Premiership clash at Fir Park. The Steelmen remain second bottom and in the relegation play-off spot, level on points with Hamilton Accies and four points ahead of bottom club Inverness with three matches remaining. Michael Gardyne shot wildly wide for County early on in a dull first half on Saturday in which Scott McDonald's volley straight at County keeper Scott Fox was the only other clear attempt on goal. Dingwall defender Kenny van der Weg was booked for a late first half foul on McDonald, the last incident of note in a poor first 45 minutes. 'Well started the second half in a lively fashion and Elliott Frear's excellent cross was shouldered over by Carl McHugh.before another great run and cross by Frear found no takers in the middle. There was an anxious moment for the Steelmen at the other end when Jim O'Brien's low ball was just missed by sub Reghan Tumilty in the centre. 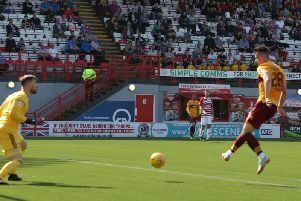 Debutant Motherwell goalkeeper Russell Griffiths - brought in for Craig Samson - made a fine stretching save from Craig Curran's header before Lionel Ainsworth shot into the side netting at the other end after a Louis Moult pass. The Steelmen almost broke the deadlock on 61 minutes when Lasley's short free-kick to Ainsworth preceded the English winger sending in a powerful low shot which Fox turned round the post. Disaster then struck for 'Well when defender Zak Jules made an inexplicable decision not to let the ball run out of play for a goal kick and Curran's cross to the back post was bundled in by Routis. Motherwell never came close to finding an equaliser in the closing minutes and now face a crucial derby at Hamilton next Saturday. Motherwell: Griffiths, Hammell (Jules 66), Heneghan, Ainsworth (Bowman 75), McHugh, Moult, Cadden, Lasley, Frear, Campbell (Clay 82), McDonald. Ross County:Fox, Fraser, Naismith, O'Brien (Franks 64), Gardyne, Woods, Dow (Routis 28), Curran, Chow, Davies, Van der Weg (Tumilty 45).